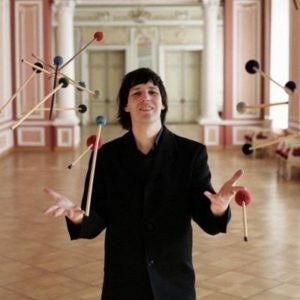 Alexei Chizhik – composer, the only vibraphone player in the world to perform with five sticks at the same time. Has collaborated with such outstanding musicians as Plácido Domingo, Mstislav Rostropovich, Wynton Marsalis, Mariss Jansons, Andrei Kondakov, David Goloshchekin, Arkady Shilkloper, Vladimir Ashkenazi, Krzysztof Penderecki, Eddie Gómez, Larry Porter, Billy Drummond, Andrea Marcelli and JD Walter. Has given recitals at the Mariinsky Theatre, the St Petersburg Philharmonic, the St Petersburg State Cappella, Smolny Cathedral and the Jazz Philharmonic. For twenty-four years he has held concerts in St Petersburg’s Summer Garden. Has taken part in various festivals in St Petersburg(JazzQ), Moscow (City Jazz Fest), Murmansk (Barents Jazz & Blues Festival), Chita (Flowering Rosemary), Krakow (Days of St Petersburg), Tallinn, Berlin, Narva and Bad Homburg. Since 2010 he has been a member of the Ekkehard Wölk Jazz Trio (Berlin). Has produced jazz quartet arrangements of the ballet The Nutcracker and the operas Le nozze di Figaro and Carmen. Producer of the “Perm. White Nights festival”.